Again, this is from the Jim Lahey book about the n0-knead method. Unfortunately, this particular loaf had a few issues. First, we had a heating failure overnight that brought the fermentation process to nearly a halt for a bit. 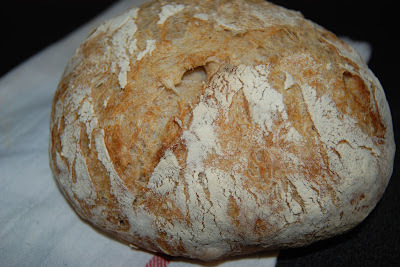 As a result, I had to knead it a bit to coax it along so I'd be able to bake it that night. 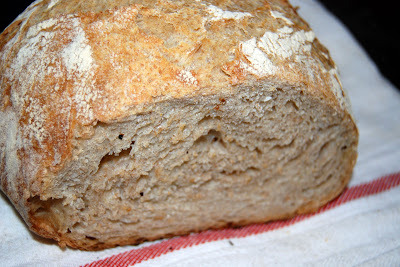 The extra kneading gave it a finer "crumb" (more uniform holes inside). Then, for some reason I've yet to figure out, the bottom decided to char while the top was largely not cooked. I suspect this was my fault for not thoroughly cleaning the flour out of the pot after the previous batch of bread. Nonetheless, this loaf came out fantastic and, once again, exceptionally easy (barring unforeseen circumstances like the heat, of course). I highly recommend giving this method a try! Incidentally, a good friend posted a comment with this recipe that she's been meaning to try. It looks absolutely delicious and basically uses the Lahey method minus the pot. The result will be an easy to make loaf that'll probably have a softer, more sandwich-friendly crust. I love that it's being used as one of those make-it-yourself gift kits that you often see made with quick bread mixes. Great idea!